A versatile technical pen for use with all Koh-I-Noor inks. Point sizes range from very fine to very broad for a loose sketching style or a finely detailed pointillist technique. 7-pen set includes a bottle of Koh-I-Noor ink, and the following color-coded pen sizes: 0.13/6x0, 0.18/4x0, 0.25/3x0, 0.30/00, 0.35/0, 0.50/1, 0.60/2. The set comes in high quality, clear-faced case. 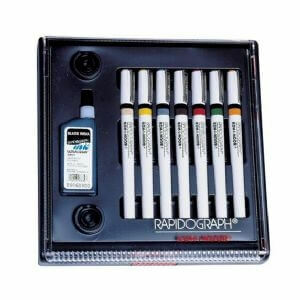 I have always trusted Kohi-Noor and have had my Rapidograph pens for 16+ yrs. I am looking forward to receiving my new set very soon. This is a good set of pens. the set comes with stainless tips and when are worn down tend to create sharp edges. My recommendation is to get jewel tip replacement tips (assuming that you can find them). You will get a longer life out of the pens and the jewel tips will not scratch the paper you are working with. Enjoy!